The ACT Government plans to invite expressions of interest from 31 October for a private consortium to build, own and operate a light rail system for a period of 20 years. The Capital Metro light rail, or tramway, will come into service in 2019 along a 12 km track between Gungahlin and Civic via Dickson. The ACT government has announced construction costs of upwards of $800 million. Details of the likely operating costs (or losses) have not been made available, but the $800 million will have to be paid back somehow. Repaying construction costs over a period of 20 years will cost the public purse some $40 million a year before any interest or other operational charges are included. This is one of the largest single capital investment projects in the history of self-government, a once in a lifetime opportunity to embrace a new vision for Canberra and to revolutionise and modernise the concept of public transport. Such a light rail service should connect the city to the airport and unify the major town centres as well as giving access to national attractions in the Parliamentary Triangle. It should give significant advantages for public attractions and tourism and play a part in the commercial, social and cultural life of Canberra. It’s a big-ticket item – but it needs some big ticket thinking. 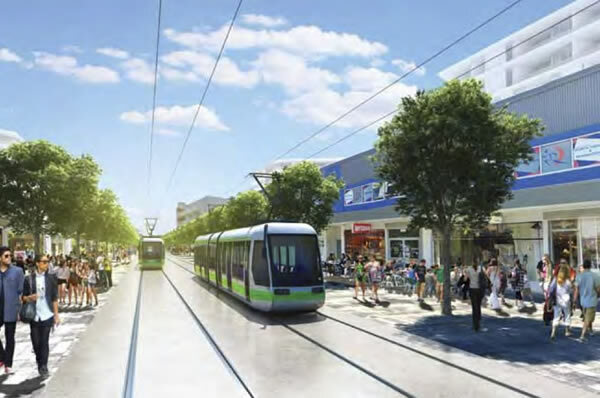 The concept of light rail is and always has been a very seductive and attractive option for Canberra –the Walter Burley Griffin blueprint includes provision for tramways. But light rail must cater to the city’s entire transport and commuting needs and all residents, not just to resolve a traffic bottleneck for Gungahlin residents. The likely public costs of building and running the system are vital and should be publicly available in order to inform and consult with residents. The cost of Capital Metro and the service must be seen against the ongoing annual outlays for the ACT government to underwrite ACTION bus services, currently more than $100 million a year. Yet as it stands, Capital Metro is unlikely to make any significant difference. It is hardly encouraging that chief objective of Capital Metro website is reduce the use of motor vehicles. Getting people out of cars and onto buses has been a mantra of all ACT governments. They have embraced arguments which serve to demonise drivers and strive to banish motor vehicles. This has been used to justify the selling off of hundreds of millions of dollars of public parking space across the city and the town centres. Car drivers are being forced to the margins of Civic and town centres, offices and businesses shops and entertainment. Drivers should not be discriminated against because the existing public transport doesn’t satisfy their needs. Buses do not allow the essential freedoms and mobility to shop or to take their children to and from daycare, to manage their families or carry out other personal or official business during the day or to visit gyms or sporting events at lunchtime or before and after work. Light rail does offer attractive options for commuters, especially if you live in gridlocked Gungahlin. But does Capital Metro go far enough? Do we want a light rail system that is going to cost almost $1 billion to build and yet will service a small proportion of the population? Or should we have sought a bigger blueprint that embraces and unifies the city, the town centres and Canberra’s social and economic well-being? I recently had the opportunity to spend a day in Melbourne. Whilst there I experienced my first ever tram ride anywhere. Hopped on the 96 from St Kilda to the city centre on a pretty new and modern tram. Good experience. While in the city I watched the 96 trams come and go. I think there was one every 5 mins or so back to St Kilda. Each one was pretty full when it left. I started talking to the station attendant, who said that its pretty much like that all day every day. The light rail works well for Melbourne, especially when you consider that the equivalent of the Canberra population was probably in Bourke Street that day. And they all work in Canberra City and currently have no other way of getting to work, do they? The trams will have to rob existing Action bus commuters to get any passengers. What is the point in having two modes of pubic transport competing along the same route? Firstly yeah people have other ways to get to work, cars for exmaple. Plenty going down Northborne Ave every day. As for working elsewhere yeah many do, but what do many do these days that get the bus. Yep many change in the City so what is the difference. As for competing with buses, who says that is what will happen? Common sense will say that the 200 series buses will be replaced by the light rail, though one would expect the Xpressos from the burbs to continue on through as they do today. Re the cars going down Northbourne Avenue every day, most keep going through the city. The axiom that all Capital Metro commuters from Gungahlin work in Canberra City is totally unfounded and false. There is no case for modal shift from buses to trams either. So how many daycare centres/schools are located right on the route to generate the shift in commuter behaviour that is being touted? Maybe wait till the population density is much, much higher along ALL the corridore – not just selected little bits of it. There is only a fraction of the route along Northborne Ave that has businesses along it. Maybe wait till the benefits costs ratio gets to be greater than 1:1 mostly on economic grounds, not getting there because of fudged plusses such as social benefits, green things, etc, maybe wait until the ACT territory budget is in better shape instead of underwriting a PPP for the tram, maybe wait until/if technology makes it more affordable for the tram to be rolled out across all the city, maybe wait to see if busses become even more viable than thay are – and while on that issue, properly plan and cost a bus transit/priority system across the whole city as a viable comparison (keeping an open mind of course !). The “build it and they will come” strategy is a joke and an impending possible financial calamity for all ACT Ratepayers. It is disturbing that some in the ACT still think its a good idea. It will and probably should come – but not yet – now is not the time. Oh pleazze. Gee using your logic no road should be built until all the houses are built to utilise said road. Clearly it doesn’t work like that, so why would or should public transport be any different? In fact I will say now that lack of public transport in brand new suburbs forces people to seek alternatives, usually driving, which sets patterns that then become hard to change. Oh as for Northborne Ave, it has had high density housing down it for years, and does have business splattered along it. Look at the intersection with Wakefield Ave and of course further down from Haig Park. Plenty of them. As for financial calamity, I did the sums a few posts up. Say $800m construction, $800m interest over 20 years that equates to $230 per person per year. Hardly bank breaking is it when put in context rather than melodrama straight from the Liebral Party play book of scare mongering. Your analogy to roads is absurd. We all use roads either directly or for transport of goods/services needed. Roads go in first because they are needed to get vehicles in to construct buildings, infrastructure, etc. Its just not the interest either. The capital outlay (especially if its funded by the pvt sector) needs to be repaid too. So, how many tram stops do u think will be necessary down Nothbourne to service the spread out biusinesses and residential so that people dont have to walk too far ? It will be a stop/start trip – about 3 minutes shorter than by express bus is the projection I heard. and that $230 per person in the ACT per year. You do what the ACT Gov’t + ACTEW do with cost increases. Break it down per person (or per day by some) so it doesn’t sound like much. Well, it is. Add that to all the other increases the ACT Gov’t (+ the Feds + ACTEWAGL) are rolling out all the time. In aggregate, it’s heaps and is making Canberra almost unliveable now. The tram just doesn’t stack up economically – at least at the moment. Even this morning, an ex senior official in the ACT Treasury is reported this morning as saying so. I reckon what we need most n the ACT is a voter intelligence/common sense/maths test before residents can vote at the next ACT election………. If you think the cost will stop at $800m for this short stretch, you have been taken for a ride. The cost has already jumped from the $600millions to the $800s. A similar stretch of light rail in the Gold Coast cost $1600million. ACT has 145229 households, so that’s $11,000 we have to find on top of our already high costs in rates, land taxes etc. All to service an estimated figure as low as 13,000 people. Our buses are already running incredible losses as well. This is economic disaster of the monumental kind. And there are all sorts of arguments on why a tram is a bad idea, not least the difficulty of express trams not being able to pass multi stop trams, the onset of new tech such as telecommuting, electric cars that drive themselves, capacitor buses/trams etc. We also have the destruction of Northbourne Avenue boulevard coupled with endless roadworks. The tram is an economic white elephant and just a really, really bad idea. Don’t put the art before the horse, fix what is wrong with Canberra’s planning, THEN build a Light Rail that will work as promised. Umm that is exactly what they have been doing along this corridor, and also why it will only work along this corridor. Bit hard to ‘fix; established areas. Many of the issues you have raised have been fixed. The density of housing along Flemmington Road and the Gungahlin town centre is quite dense, with room for more. Northborne Ave is also quite dense with business splattered along it. They have a road network that could feed a park and ride near the racecourse, which is how light rail in car dominated US works. So how much longer should we wait? Maybe wait until the whole corridor is developed and people have set their travel patterns maybe? If so too late. Frankly now is the time. Why wait ? Maybe wait till the population density is much, much higher along ALL the corridore – not just selected little bits of it. There is only a fraction of the route along Northborne Ave that has businesses along it. Maybe wait till the benefits costs ratio gets to be greater than 1:1 mostly on economic grounds, not getting there because of fudged plusses such as social benefits, green things, etc, maybe wait until the ACT territory budget is in better shape instead of underwriting a PPP for the tram, maybe wait until/if technology makes it more affordable for the tram to be rolled out across all the city, maybe wait to see if busses become even more viable than thay are – and while on that issue, properly plan and cost a bus transit/priority system across the whole city as a viable comparison (keeping an open mind of course !). The “build it and they will come” strategy is a joke and an impending possible financial calamity for all ACT Ratepayers. It is disturbing that some in the ACT still think its a good idea. This is the main reason a PPP won’t work. The proposal is a lemon no matter what way it is tarted up. That is just silly to say that if the government wants to do something they should stump up the money personally. You could kiss goodbye to roads, pools, schools, hospitals, sport facilities etc on that argument. Light Rail will not bankrupt us anymore than the vastly greater sums we have spent on roads and other infrastructure have bankrupted us. Nor the incredible amounts of money the Liberals wasted when they were in power, but would like us to forget. BUT, there is the question of given LR’s price, huge capacity and weird location is it a good idea? As it is planned it is just a bus substitute, offering nothing but a nicer, quieter and cleaner ride at exactly the same speed and along the same mostly uninhabited route from an undistinguished outer suburban centre that is not a destination in itself to a City Centre that is not THE destination in Canberra. Light Rail is no solution for the awful town planning that has made Canberra what it is today. A relatively small number of people spread as far apart as possible, unconnected by anything other than a meandering, overpriced and overbuilt road system. The planning targets public transport right between the eyes and ensures it will never work. Whether it is a train station way out at Kingston, that is not even convenient to Kingston, or an Airport close but inaccessible which pays for itself by extorting passengers attempting to reach their flights, either in taxi surcharges, astronomic parking charges or a next to useless shuttle service. We live in a city designed for people who like to park on the green open spaces of the “Garden City”, or have chauffeur driven Comm cars to get us around. You obviously have little knowledge of the financial carnage this government has left for ratepayers to clean up. Ever heard of Rhodium Asset Solutions? This was a finance company that ACT Labor reckoned they could set up and make money with. The outcome was losing millions of dollars of ratepayers money; exactly how much nobody knows (or doesn’t want us to know). There are other examples but the Capital Metro light rail is shaping up to be the mother of them all. This is going to end up like the Channel tunnel in the UK. Yes it’s nice and quick, however, it costs a third more than going by ferry. The ticket prices for the light rail will be more than bus tickets and there’ll still be buses doing the same route. Sorry, but there will not be anywhere as many busses “doing the same route” as light rail. I would imaging that many bus services will be diverted/lengthened to take in light rail stations so u can jump off the bus and onto a tram. There is no way the existing bus service along the route will be the same post tram as pre tram. They have to get comuters onto the tram somehow ! How far will Capital Metro be in terms of actual construction before the next election? It’s a great idea in theory—who wouldn’t support a feasible light rail network servicing our sprawled out city? In practice, I can’t see it being any more than a massive white elephant—underused and terribly over budget. ACT Gov’t will ensure that they sign contracts before the next election in 2016. It would never have got legs if we were still under the control of the Department of Territories and I think Canberrans could see that something like this might happen if we got self-government and that is why we voted twice (or was it three times?) for the status-quo to continue. Now we are realising our worst nightmare whereby an oligarchy of unaccountable, idealistic zealots, cheered on by self-interested parasites and self-appointed experts are running the Territory, are consigning us into a financial black hole. The fact that Federal governments have repeatedly knocked back funding submissions for a light rail is tantamount to the oversight that would be prevailing if the Department of Territories were still in charge and early comment from some in the rail industry that Canberra was too small for a light rail project and it would not be attractive for a PPP, have been totally ignored. This typically demonstrates the total lack of commercial judgement by the government. If the deal is so good why doesn’t the ACT Labor Party and Greens as individual members raise the money themselves and run it themselves? One reason would be that they would first have to convince a lender it was viable and then have to sign personal financial guarantees. That would be as far as it gets. Instead, they are abusing their power by assigning all the risk to ratepayers who will have to stay here and pay it off while the politicians have the choice to leave Canberra but still live off the generous ratepayer funded pensions with impunity. So Federal government knows best, local is unaccountable. Though except for elections every 4 years. The fact the people of the ACT have kept on voting Labor means one of two things. They like what Labor or doing, or they think your Liebral party doesn’t offer a suitable alternative. My money is on the latter. As for this project it is interesting you use comments such as commercial judgement. In business you would have a point, but government is not necessarily about commercial it is about delivering services that they believe the community needs and wants. If infrastructure was purley done on commercial basis we would have no free roads what so ever. Every road in this town that is built would need to be tolled to make it commercial, but alas we accept that as a community our tax and rates money needs to pay for things that don’t stack up commercially. Some other examples would be schooling, hospitals, police, fire, ambulance, the list goes on and on. I also accept there is a large portion of the community who doesn’t see the need, mostly in South Canberra, who are probably jealous Gungahlin is getting it and they are not, doesn’t mean it is a bad thing. We could also do without the melodrama and rhetoric of a debit to be paid off for years, your mates in the Federal Liebral party are doing that one to death it is getting boring. Simple fact if it is going to cost $800m then that is about $2.5k for every man women and child in Canberra. Lets say even with interest amounting to lets say another $800m and a pay back over 20 years that works out to be about $230 per year per person. Seems ok to me, sh$t I am even willing to put in your bit if your too much of a tad wad, and guess what I don’t bloody well live in Gungahlin and never want to either. There’s just no justification for the proposed light rail project no matter which way you look at it. The same commercial investment in Civic (not to mention other town centres) could occur with rapid buses, for way less. and we could all benefit with rapid buses, not just a small part of Canberra who doesn’t need it anyway (because there are loads of buses along the same route). We already have the buses and a great road network. A fantastic city-wide bus network could be envisaged to take this city into the 21st C without having to relocate a single pipe or cable, for far less money, and way faster and more efficiently. The Govt just has to be motivated to sell it, the same way as they are seeking to market this light rail that simply duplicates bus routes we already have. It’s baffling why they are trying to sell it, when their own studies show there is no advantage in light rail whatsoever, only massive expense for no gain. I vote we restore the pluses of buses! Everyone says that the cost is going to be increased over the next 10 – 15 years. Just look at the technology cost 10-15 years ago and what the exact same technology costs today. Also what’s the cost for the construction that isn’t directly paid by the construction company? Lost work hours waiting in traffic and lost business from the 4 year disruption along Northbourne. Not to mention the interest on $800million over the 24 years to pay it off. Just because the Feds didn’t provide funding in the 2000s doesn’t mean they wouldn’t have if we were still under the old no self-government system. 1. The ACT Government’s submission in support of the funding was merely a high-level wish list rather than a business plan. 2. The Dept of Territories/ NCA had planned a number of rapid mass transit routes that were never built. For example, the green space between Coulter Drive and Florey shops was envisaged as an extension of the (now disused) bus lanes from the Belconnen town centre. 3. In fact, at the now-demolished Belconnen bus interchange, the downstairs area along Benjamin Way was pictured as a light rail station (this is referenced in a paper – I don’t have access to it at present). 4. It is widely accepted that many people wanted to vote against self-government because it was seen for what it was – an attempt by the Feds to save money (i.e. there would be less spent on infrastructure etc.). None of that changes your views on light rail, but I wanted to offer these alternative views of your narrative. I agree with what you have said and you have cited some good examples of what was once proposed and why. I recall Simon Corbell pushed hard for exclusive express bus lanes from Belconnen to Civic about 15 years ago. Add that one to the list. I like trams and I travel on them when ever it is convenient (that usually means a car isn’t an option). This is why trams flourish in Europe; people live in high density apartments and even if they had a car they would have nowhere to park it. In some cities like Tokyo, one has to own a parking space before one is permitted to own a car. In Singapore, a Toyota Prius costs $150K!. Canberra was a planned city with lots of roads. We should rejoice that despite what Labor are trying to do (sell off all the city carparks) we are still able to go anywhere at anytime in Canberra by car. Where else in the world can that be done? If we have to use public transport the buses are there. Trams are essentially buses without flexibility.